When I saw this yellow coat in J.Crew's email announcing their new fall arrivals, I immediately fell in love. I had been toying with the idea of a colorful coat for this fall/winter (especially since I will actually get a lot of use out of it living in Italy and traveling around Europe). I thought I wanted a blush pink or maybe even a kelly green, until I spotted this gorgeous yellow beauty. And I was really sold when I discovered that it is currently 30% off! Fortunately, my wonderful and amazing friend Kelly has agreed to bring it to me when she comes to visit me in Florence in November (#truefriendship), which means I will also have it for my Parisian adventures with Britt later that month. 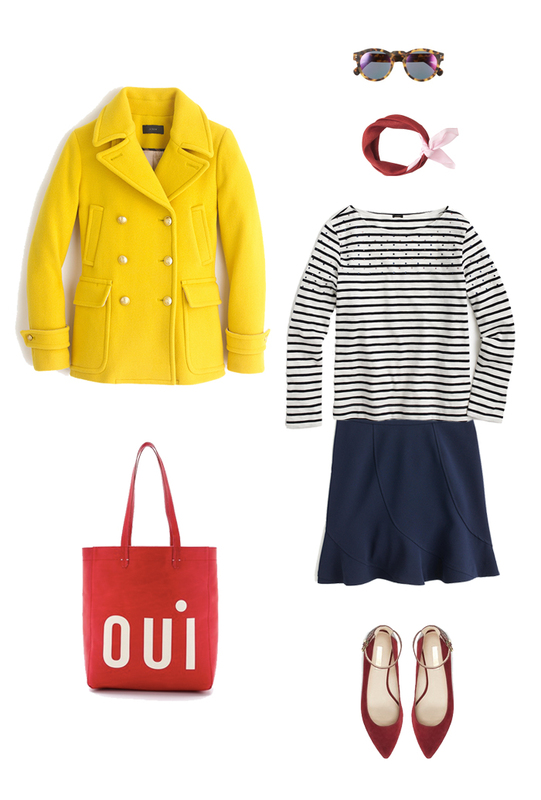 I couldn't resit the French theme, and I can't wait to pair it with a Breton striped top, my favorite navy fluted skirt, a bright red lip, and some cheeky french accessories (pretty sure my petite beret will look fab with it). I try to look for a statement/inspiration piece to add to my wardrobe each season. Do you have a statement piece for fall?